Uri Shulevitz, “It’s getting dark,” said boy with dog. “How sad, the day is no more,” “Dusk,” said grandfather with beard, 2013. Ink and watercolor on paper. Dusk by Uri Shulevitz [Margaret Ferguson Books, Farrar Straus Giroux 2013). ©Uri Shulevitz. All rights reserved. Stockbridge, MA, November 12, 2018—Before the winter solstice, as the days grow shorter, people of every culture long for the return of light. This fall/winter season Norman Rockwell Museum will explore the commonality and distinctiveness of people through the art and stories found in children’s holiday picture books created by six award-winning illustrators. Cultural Traditions: A Holiday Celebration is on view at the Museum from November 17, 2018 through February 10, 2019. Featuring over 40 original artworks representing traditional winter holidays, the exhibition has been organized by Norman Rockwell Museum, and curated by Barbara Rundback, the Museum’s Assistant Curator. 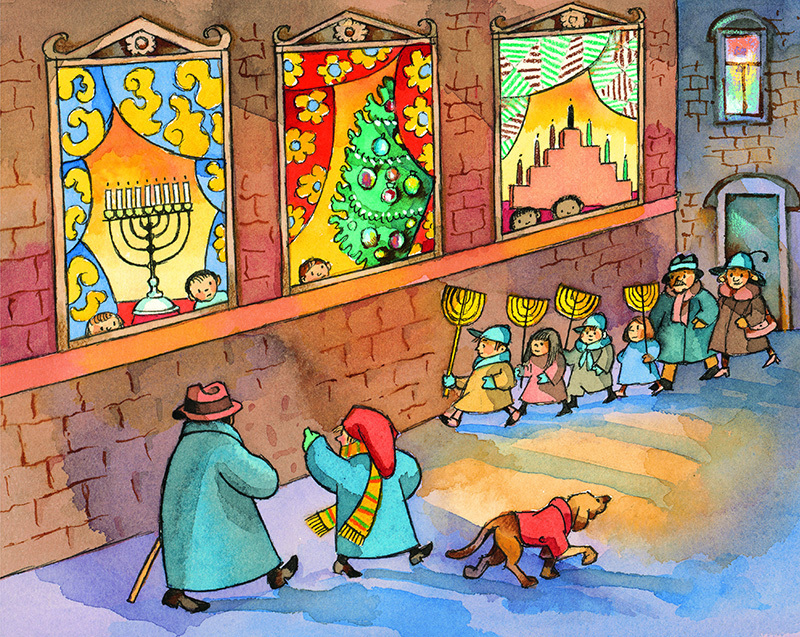 Illustrating Hanukkah, the Jewish festival of lights, Harriet Ziefert’s Hanukkah Haiku (2008) uses a traditional Japanese poetic form to commemorate the eight nights of the holiday, as illustrated by artist Karla Gudeon. Known for her decorative engravings and paintings, Gudeon’s lively watercolor on paper paintings match the description of each night of the holiday as the branches of the menorah are lit, in this cultural crossover. The Night Before Christmas is brought to life through Russian-born illustrator Gennady Spirin’s 2006 rendering of Clement Clarke Moore’s classic holiday poem. Recipient of numerous Gold Medal Awards from the Society of Illustrators, Spirin’s gold highlighted watercolor and colored pencil illustrations recall an old-fashioned Christmastime feel, with a nod to Russian art traditions. A different take on the Christmas holiday is presented in 1999’s The Night of Las Posadas, written and illustrated by Smithsonian Medal and Children’s Literature Award-winning artist Tomie dePaola. The religious observance, celebrated in Hispanic and Latino culture, is given a Southwestern style, and dePaola’s acrylic-on-handmade watercolor paper illustrations bring this charming story of a Christmas Eve miracle to life. Author Andrea Davis Pinkney and her husband/illustrator Brian Pinkney provide a pictorial guide to the African American holiday Kwanzaa in 1993’s Seven Candles for Kwanzaa. The couple, each a former recipient of the Coretta Scott King Award, tell the story of Kwanzaa, named for the “first fruits of the harvest,” through an overview of traditions, Swahili translations, and Brian Pinkney’s colorful scratchboard illustrations. Celebrating the Chinese New Year, Newbery Award-winning author and illustrator Grace Lin’s Bringing in the New Year (2008) tells the story of a family celebrating the customs and traditions of the holiday, which are meant to bring good fortune. Recognized as a Champion of Change for Asian American and Pacific Islander Art and Storytelling by President Barack Obama, Lin’s bright and decorative gouache renderings for the book mirror the festive holiday. Finally, the various light displays of Hanukkah, Christmas, Kwanzaa, and the winter sunset, come together in Dusk (2013) by Caldecott Medal-winning illustrator and author Uri Shulevitz. The whimsical picture book follows the journey of a grandfather, grandson, and their dog through the streets of New York City “as nature’s lights go out” and the “city’s lights come on.” Shulevitz’s ink and watercolor illustrations bring the distinct mood of the early winter season to life. In addition to Cultural Traditions, the Museum will present a special installation of original works from Eve Bunting’s One Candle, illustrated by K. Wendy Popp. The pastel and conté crayon works, part of the Museum’s permanent collection of illustration art, tell the story of one family’s unique Hanukkah tradition inspired by past experience.